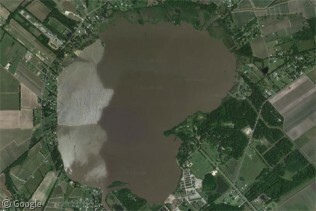 In a major industrial ‘oops’, on this day 34 years ago, a man-made disaster drained Lake Peigneur in Louisiana. Although the exact cause isn’t known, it is believed that an oil rig miscalculated its position and drilled into a vast system of caverns left by salt mining. Once the bottom of the 3m (10’) deep lake was compromised, the water had nowhere to go but down, with a large whirlpool pulling in the oil rig, barges and several acres of surrounding land. As we said, a rather big ‘oops’. Once the caverns were full the water pressure stabilized and the lake refilled when a canal reversed direction and – temporarily creating the state’s tallest waterfall – flowed into the empty space, filling the former freshwater lake with saltwater from nearby Vermilion Bay, permanently changing its ecosystem. This YouTube video has a good history of the disaster.